Women’s flat ‘Sneakerloafer’ shoes from FitFlop. Crafted from crinkle-patent leather, the shoes boast a traditional loafer silhouette, yet feel like sneakers to wear. 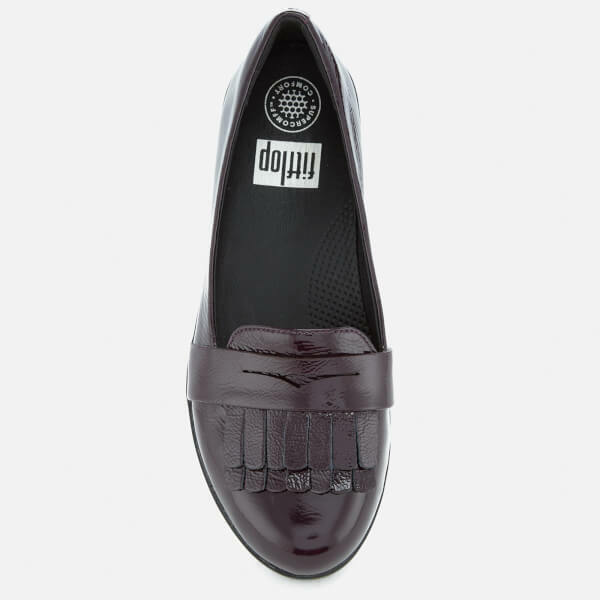 The slip-on design comprises a rounded toe with leather fringe detailing to the front. A cotton lining, leather footbed and seamless, built-in arch contour also feature. The ergonomic shoes are placed upon a chunky yet ultra-lightweight sole with slip-resistant rubber pods to the base. The wood-effect midsole utilises FitFlop’s patent-pending SupercomFF midsole technology, which provides all-day comfort by diffusing areas of high pressure. Upper: Leather. Lining: Cotton. Footbed: Leather. Midsole: SupercomFF. Sole: Rubber.